I honestly can’t get enough of the She is Boutique pieces I sneak into and *need* in my closet. These booties that will be part of the new arrivals next Sunday- so stay tuned and this dolman cardigan that is NOW available- it’s the perfect tone for fall. Gives your ootd a p o p of color. It’s definitely one of my fall favorites and it’s only $44. 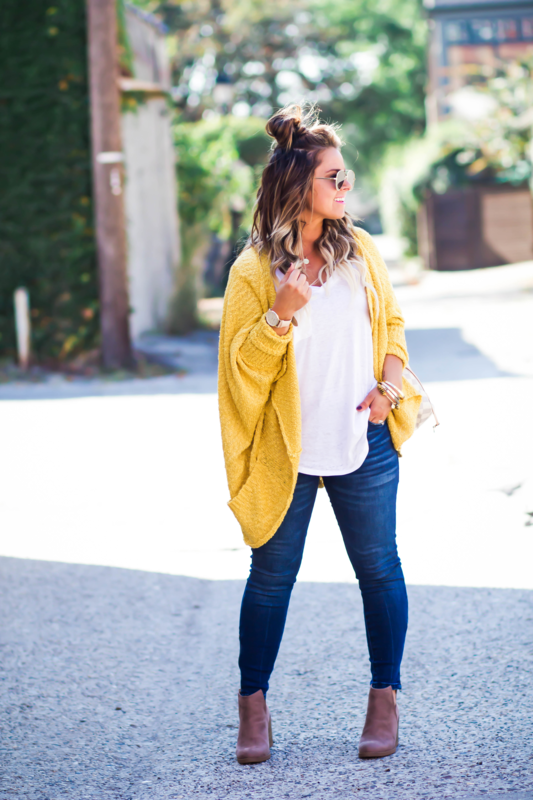 It’s a gorgeous bright yellow, knitted dolman cardigan with a slouchy fit and did I mention how ridiculously comfortable it is?! I paired these pieces with a basic white pocket tank from White Crow and some of my favorite blue jeans that I purchased from Nordstorm. To finish my outfit, I detail it with accessories and I always carry these sunnies and my absolute favorite bag you can purchase, here. It’s always my go-to! Thanks for stopping by and have a great Tuesday babes! Xo.